This reading group guide for Beach House Reunion includes an introduction, discussion questions, and ideas for enhancing your book club. The suggested questions are intended to help your reading group find new and interesting angles and topics for your discussion. We hope that these ideas will enrich your conversation and increase your enjoyment of the book. Home is where the heart is. Returning to the idyllic Isle of Palms three years after losing her husband, Cara Rutledge is ready to embark on a fresh start. Moving into the beach house once owned by her mother, Cara finds everything and everyone on the island to be comforting and familiar. Yet at the same time, heartbreaking memories often resurface. 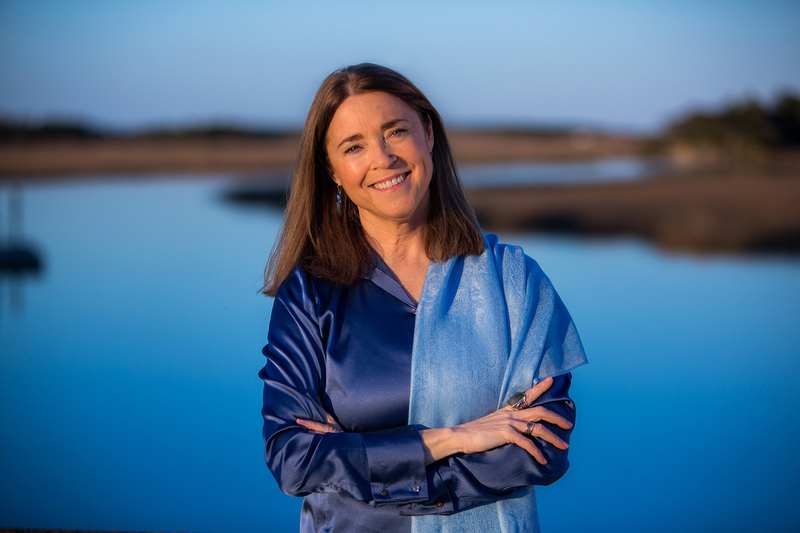 Only through reconnecting with friends, family, and the beauty of the lowcountry does Cara find the strength to release her painful ties to the past and welcome the opportunity for a new love, career, and hope for the future. Meanwhile, Cara’s niece, Linnea, is a recent college graduate unsure of where her life will take her. Rather than live with her parents in their historic Charleston home, filled with entitlement and expectations, Linnea heads to her aunt’s beach house for the summer. At the house, the presence of her grandmother Lovie, the original “turtle lady,” can be felt all around her. Linnea remembers the lessons her beloved grandmother taught her as a child, which encourages her to rediscover her passions and pursue new possibilities. Rejoining the turtle team, learning to surf, and falling in love, Linnea finds the strength to break from tradition and find her own purpose. In this heartwarming novel, three generations of the Rutledge family come together to break destructive family patterns, resulting in new bonds that will last far beyond one summer reunion. 1. Each chapter of Beach House Reunion opens with a fact about sea turtles. Discuss how the information increases awareness of the species. How do they relate to either Cara’s or Linnea’s story? 2. Cara moves back to Isle of Palms after making significant changes in both her personal and professional life. What’s the motivation behind her return? Do you find too much change at once to be overwhelming, or exhilarating? Discuss the role of family support in the life of a new mother. How do friends fill the role of family? Do you agree with Flo that “it takes a village”? 3. “Make do” is a phrase that Cara’s mother, Lovie, used to say. What does it mean? How does this expression relate to Cara’s life? Do you incorporate a similar mantra into your life? 4. What traditional roles in Charleston society do Palmer and Julia expect their children to follow? Do you think their convictions of how young men and women should present themselves are outdated or sexist? Discuss how Cooper and Linnea break from their parents’ conventional values? How are traditions and values changing for the young in your area? 5. Motherhood came as a surprise to Cara: “This opportunity to be a mother came out of nowhere. I was speechless. A deer caught in the headlights. I swear I couldn’t breathe for days while I agonized over the decision” (p. 34). Consider the unique challenges she faces as a single parent in her fifties? What advantages might she enjoy? 6. Lovie has a significant presence in this novel. How does she help navigate the choices of the Rutledge women—Cara, Linnea, Julia? And her son, Palmer? 7. For Cara, Capers Island holds precious memories that tie her to Brett. Describe the pivotal moment when Cara buries her wedding band in a sand dune. How was this act transformative for her? Why do you think she felt it imperative in order to move on? 8. Consider the dichotomy between Cara and Linnea’s feeling of home. Cara relocates her life to move back to her mother’s beach house for a sense of ease and belonging, while Linnea is eager to leave Charleston for a chance of possibility and hope. How can home feel protective for some, and obstructive for others? What symbolizes home to you? 9. Cara begins to accept that her “divided heart” (p. 279) is normal, and admits she is ready to fall in love again. “The love I have for David is different than the love I had for Brett. But I’m different, too. And it doesn’t mean there can’t be love after love” (pp. 279-280). What’s so enlightening about Cara’s breakthrough? How does she come to this place of understanding? Do you think a person can feel different kinds of love? 10. Explore the significance of the rescue and rehabilitation of Big Girl. What does Big Girl symbolize for the Rutledge women, and for Toy? How is she a pillar of strength and resilience? Is Big Girl’s rehabilitation a metaphor for what the women are each experiencing in their lives? The final release? 11. Discuss the impact of the water/ocean in this novel on the Rutledge women, even the baby. Cara goes to the sea “to relieve stress, to gather her thoughts, to recharge her batteries” (p. 98). And Linnea finds joy riding the waves. “The ocean awakened her, leaving her feeling invigorated, confident, like she belonged here” (p. 180). Do you believe in the healing power of nature? 12. Discuss how surfing (and being near the ocean) changed Linnea. What is your favorite body of water—the ocean, a lake, a pool, a bath? 13. Cara is torn about accepting a full-time position at the aquarium, until Flo put things into perspective for her: “Life is a long series of choices. All we can do is make the best decision we can at every turn, hope for the best and deal with the consequences” (p. 310). How does Flo’s advice help Cara? Do you find that her words can guide you in your own life? 14. The issue of destructive family patterns is revealed through Palmer’s alcohol abuse and trend toward domestic violence. In this book he follows the same trajectory as his father, Stratton. And in turn, the pattern is repeated in his son, Cooper. How has Palmer’s drinking affected his family? To what degree are he, Julia, and in a lesser respect, Linnea, contributing to Cooper’s drug use? And how do Palmer—and Julia—ultimately break the destructive family cycle that began with Stratton and Lovie? 15. In Beach House Reunion the character Palmer Rutledge completes a five-book character arc that began in The Beach House. He relentlessly pushed, even bullied, his mother, then his sister to sell the beach house. In The Beach House, Palmer laments, “I never got to say goodbye” after his mother’s death. Discuss how his character grew in each subsequent novel. How did brother and sister persevere, heal and finally unite in the novel? In the series? 1. In this novel, readers learn so much about sea turtles and the importance of protecting their habitat. Check out the following resources for more information on conservation efforts, and how you, too, can help. 2. Research reveals how our brains are hardwired to react positively to water. Being near the ocean can be calming, inspire us to be creative, connected. Take a walk, go for a hike, visit the water, spend some significant time outdoors—even just for a few minutes each day. Do you feel differently? Is being outdoors particularly nurturing or peaceful? Consider having a water feature at your book club meeting or hosting at a lake or beach house. 3. Linnea discovers her passion for surfing—a hobby she’s always wanted to learn. Do you have any interests that you haven’t yet pursued? Take a class, learn a new skill, try something you’ve never done before. It’s never too late! 4. Friendship and family is the heart of this novel and unfortunately; many of us don't take enough time to express our appreciation to our loved ones. Show your friends or family how you care about them. Consider writing cards, inviting them over for dinner, giving them a phone call, or, better yet, organizing a trip. 5. Beach House Reunion can be read alone, but it is also the fifth book in the Beach House series. 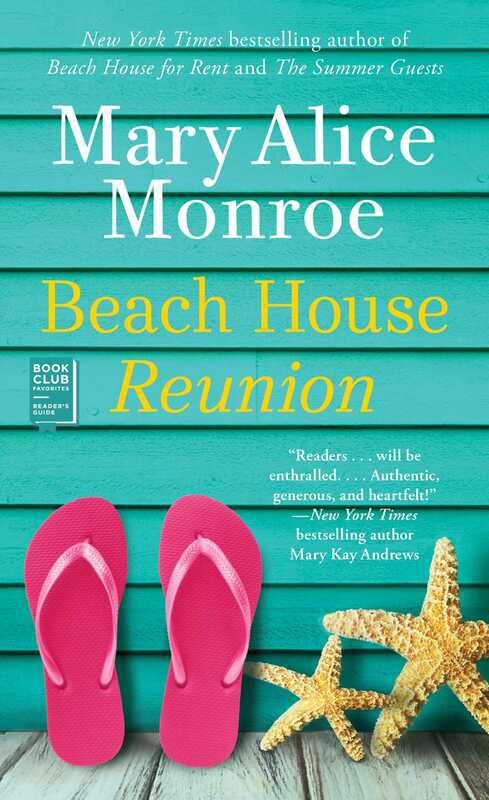 To go back and read more about the Rutledge family of Charleston read Mary Alice Monroe’s The Beach House, Beach House Memories, Swimming Lessons, and Beach House For Rent.